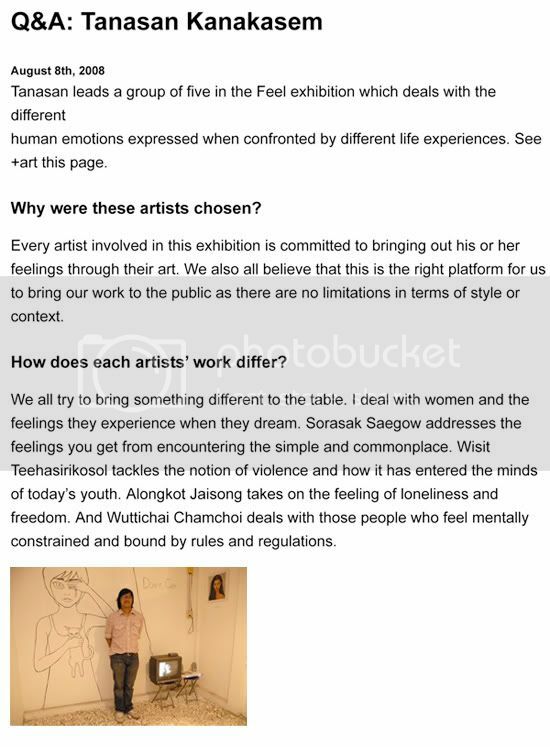 Feel, the exhibition by the group of young Thai artists. Tanasan Kanakasem, Sorasak Saegow, Alongkot Jaisong and Wuttichai Chamchoi graduated BFA from King Mongkut's Institute of Technology Ladkrabang (KMILT), and Wisit Teehasirikosol graduated BSA from Chiangmai University. Each of them had several group and solo exhibitions in several places in Thailand. Feel Exhibition represents all new artworks from five young Thai artists. Each artist expresses the feelings in different way, under the same theme ‘Feel’.